Quite often, good ideas come up when you are discussing business out of the office. Also, promises are made to send someone something, contact someone, etc. It is usually a good idea to send a follow up email after your business lunch or dinner. This can be done the next day, or a few days after depending on what was discussed. It’s also polite, can help build rapport, and is a good way to remind both parties on what next steps need to be taken. Want some help with structuring and what to say in your follow up email? 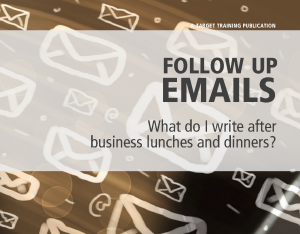 Download our one pager on Business lunch and dinner follow up emails. You can find it by clicking on the ‘Follow Up Emails’ picture above in this post.